The full-day trip to the Athabasca oil sands was the highlight of the Canadian Science Writers Association meeting, at least for me. The tour was sponsored by Connacher Oil and Gas Ltd., a relatively small player in the oil sands business. They flew a dozen of us up to Fort McMurray (about 400 miles from Calgary) in the morning, and took us first to the Oil Sands Discovery Center and then to their Algar drilling site. Biologists are very concerned about the issues surrounding development of Canada's oil sands petroleum reserves. The biggest issue is global climate change, but economics and local ecology are big concerns too. 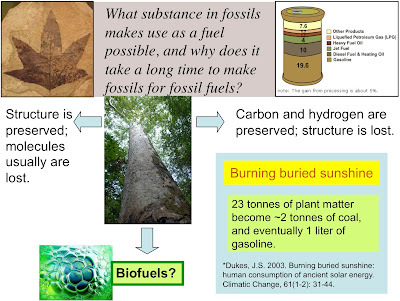 I'll start with a very simple explanation of how fossil fuels come into existence, using a slide I prepared when I was teaching intro biology. The text at the top of the slide (in italics) is a question posed by a student in the class, asking about the relationship between 'fossils' and 'fossil fuels'. Plants use solar energy to transform carbon dioxide and water into biological molecules (starch, cellulose, lipids etc). When plants (or animals) die the organic matter they contain is usually eaten by other organisms, but sometimes it's inaccessible to or too much for these 'detritus feeders' and instead is buried, where it breaks down very slowly. The oxygen content of the molecules is usually lost. Commonly the hydrogen is lost too (mostly as methane), leaving behind coal, but sometimes the carbon and hydrogen remain together in the hydrocarbon molecules we call oil. The figure refers to a paper by J. S. Dukes titled Burning buried sunshine: human consumption of ancient solar energy. I found this an excellent resource for the class. It explains that we're now burning oil a million times faster than the rate at which it was produced. Put another way, for hundreds of millions of years, a tiny fraction of the carbon dioxide that plants temporarily sequestered was buried rather than being immediately recycled. Now we're dumping all that CO2 back into the atmosphere at once (relative to the very long time scale over which it was buried). So CO2 that was sequestered very slowly from ancient atmospheres is being returned very quickly as we burn fossil fuel, and this CO2 traps solar energy and disrupts climates all around the world. In principle, there's only so much buried sunshine, and when it's all gone we'll be able to stop worrying about the causes of CO2 rise and just deal with the consequences. But the consequences look pretty bad, so prevention would be better. Unfortunately, not only is Canada a big producer of CO2, its oil industry is a big enabler of CO2 production by other countries. By extracting oil from the massive oil sands deposits, Canadian industry is making more of this buried sunshine available for burning. Worse, the extraction process itself uses a lot of fossil fuel - separating the oil from the sand requires heat in the form of steam heat, usually generated by burning natural gas. A separate issue is harm to local environments - extracting oil from oil sands is reported to be particularly destructive, both by ripping away the boreal forest that covers the sands and because of toxic products released both at the mine sites and downstream. Pipelines are another problem - they can disrupt local environments both by their presence and by leaks, and they can block wildlife movement. Oil from the oil sands is delivered to refineries in Illinois and Oklahoma by the Keystone Pipeline, and there's a big debate about running a new pipeline (Keystone XL) all the way to Port Arthur and Houston on the Gulf of Mexico. A final issue is simple economics - if the world is running out of oil, wouldn't Canada be wiser to save its reserves to use or sell later, rather than selling them now to the highest bidder? So, what did we see on the tour, and what did we learn? 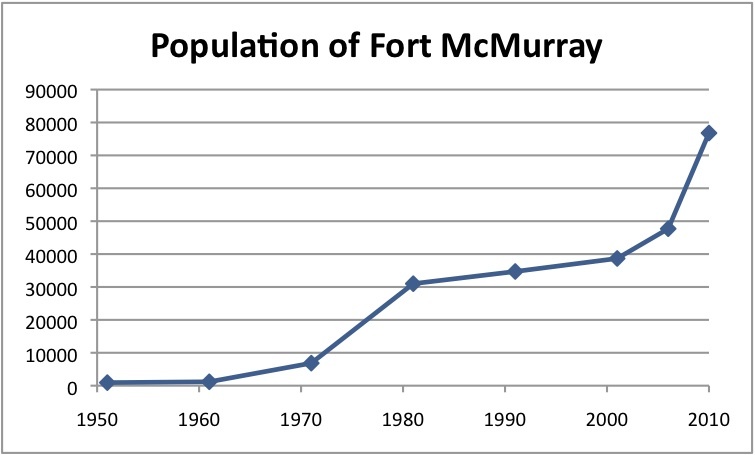 The first thing we saw was the town of Fort McMurray - a little frontier town that's grown very big, very fast because of the influx of oil sands money and workers (see graph). Housing prices are even worse than Vancouver's. Next we were taken to the Oil Sands Discovery Centre. I'm pretty sure this slick tourist attraction exists to put a positive spin on the enterprise, but it's very well done and I learned a lot. We first watched a cheesy film about the history of attempts to make money by extracting oil from the surface-exposed oil sands. The extraction itself is very easy; the film was followed by a simple demo using a beaker of oil sand and a kettle of hot water. Just pour hot water onto the sand and stir - the oil (thick black bitumen*) rises to the top and the sand settles to the bottom. Initial commercialization attempts were stymied by economic problems, both the cost of the extraction and the poor market for bitumen, especially given the widespread availability of cleaner oil from other sources. But the market for fossil fuels has grown and collossal scale of production has decreased the cost of producing it from the oil sand. Most of the Discovery Centre exhibits and equipment displays were about the mining techniques used to extract bitumen from oil sands that are close to the surface. Until recently this surface mining was the only way to recover bitumen, and it's a spectacularly nasty process. 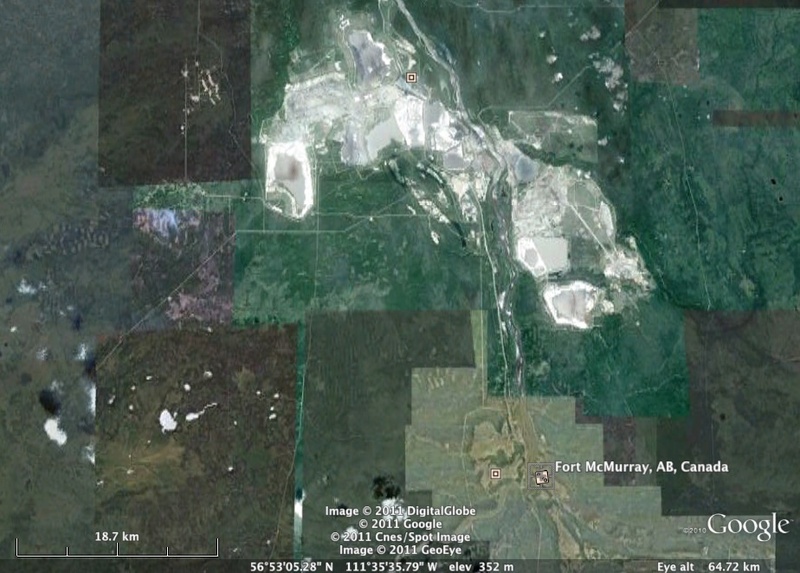 The accessible oil sands sit under 40-60 meters of 'overburden' - a pit-mining term for the beautiful boreal forest/muskeg and underlying clay and sand. All of this has to be removed to get at the oil-soaked sand, which is scooped up, mixed with hot water, and piped to nearby extraction plants where ~90% of the oil is removed. The sand then goes back to the place it came from (more or less), and eventually the surface is supposed to be restored to some semblance of its original state. Not surprisingly, this makes a big mess. Here's a Google Earth view of the main mining site north of Fort McMurray; you can get an idea of the enormity of the devastation by the tiny size of Fort McMurray itself, at the lower right (a town of 80,000 residents). Not only is the surface ecosystem destroyed, but the extraction process uses a lot of water from local rivers, and returns contaminated water first into giant tailing 'ponds' (lake-sized) and then into the river system. 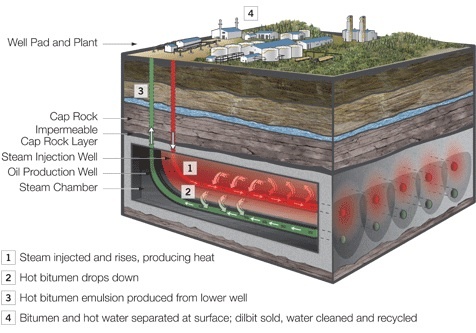 With SAGD, the bitumen is extracted form the oil sands in situ; the sand stays deep in the ground while the oil is liquefied by steam heat and pumped to the surface. This requires drilling two parallel channels about 5 m apart (each about a foot across), first down to the base of the oil sands deposit and then horizontally through the sands. The ability to drill horizonally with high positional accuracy is the technical advance that makes SAGD possible. Steam is pumped into both channels until the bitumen around and above them begins to liquefy (about 3 months). The lower channel (green in the figure) is then switched to extraction mode, pumping the liquid mixture of hot water and bitumen out to the extraction facility on the surface, where the bitumen is recovered and the water is cleaned up and reheated for reuse as steam. This extraction phase can continue for many years (20? ), and, if I recall correctly, can remove more than 80% of the oil without disturbing the sands or much of the surface. 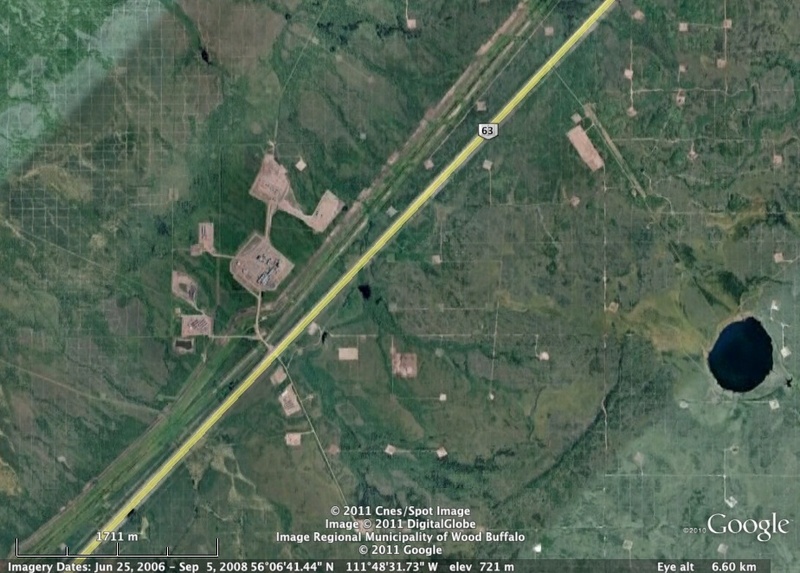 Connacher has two SAGD plants, both about 80 km south of Fort McMurray. They're much smaller than the big surface mining operation above, and much cleaner. Each consists of a big array of pairs of wells, as shown in the drawing below. 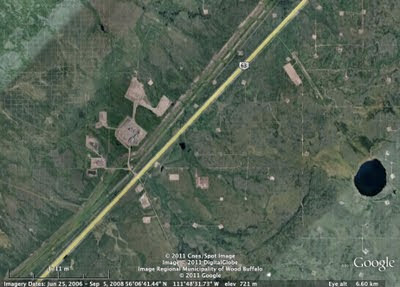 Below that is another Google Earth image; Connacher's Pod One facility is to the left of the road. Notice how small the footprint is - this image is zoomed in tenfold relative to the surface-mining image above. We didn't tour Pod One, but the even newer facility called Algar - it's been in place for only a couple of years and so doesn't yet show up in the satellite photos on Google Earth. Overall we were very impressed by Connacher's SAGD operation. There are no mine pits or tailings ponds - the only pond we saw was a tiny one that captures surface runoff (rain and snowmelt) from the extraction site so it can be tested for contamination before being released. Water use is also low. More than 95% of the water used for steam is recovered and reused. The water doesn't come from the surface (lakes, rivers) but from a deep aquifer of brackish water that's not otherwise usable, and this aquifer is so big that the water withdrawal for SAGD is insignificant. One measure of efficiency of oil sands harvesting is the steam-to-oil ratio - the ratio of energy input (largely steam to liquefy the oil) to energy recovery as oil. This matters a lot for the economics of SAGD and also for the global warming consequences, but it's hard to find the numbers. Well no, it's easy to find numbers, but they're usually not commensurate (not in the same units). Barrels of water used per barrels of oil? Cubic feet of natural gas burned per barrel of oil? Tons of CO2 produced per cubic meter of bitumen? One of the Connacher engineers told me that the energy input (for steam) was about 1/8 of the energy output (as bitumen), but this seems low. Can the steam-to-oil ratio be improved? Luckily this is an economic issue as well as an ecological one, so the SAGD operators have made some advances. One is to pump the steam in at a relatively low pressure. This allows more of its heat to be transferred to the bitumen, but requires secondary pumps to push (pull?) the oil-water mix back to the surface. Another advance is to mix the steam with a solvent that helps the bitumen liquefy at a lower temperature, so less steam is needed. Connacher is testing this in some of its wells, but I don't have any information about the energy inputs associated with the solvent (where does it come from), how efficiently the solvent is recovered with the bitumen, or even what the solvent is. I suspect this is all proprietary information. One company reportedly is using butane, which is also a hydrocarbon - I think such a solvent would be neutral with respect to global warming, being either burned directly (in uses unrelated to the oil sands) or recovered with the bitumen and eventually burned. And any solvent that isn't recovered would be a hydrocrarbon that isn't even burned. 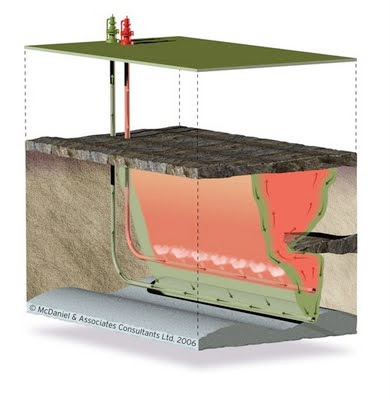 So appropriate use of solvents in SAGD would be good for the atmosphere. Solvents such as butane are less ecologically nasty than the bitumen itself, so any solvent that stays in the ground is unlikely to cause problems. The disruption to the surface ecosystem is much less than caused by surface mining. Not only is the area disturbed much smaller (just the main extraction facility, pipelines and access roads), but the disturbances needed are much shallower and thus easier to restore. Connacher operates under quite strict ecological regulations imposed by the Alberta government, and they appear to take these very seriously. They monitor wildlife using the same kinds of remote cameras we saw at Banff, although they're strictly forbidden from interacting with any of the wildlife they see. I don't know how much of the good impression Connacher made on us was created by high-quality spin. Our group of science writers felt that we were pretty good at detecting spin, but we could be mistaken. 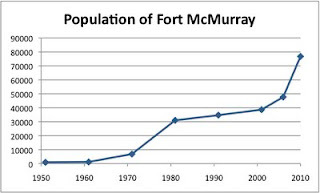 One ecology colleague of mine, whose paranoia has been honed by years of public service, suggested that the whole Connacher operation might have been created by the giant oil sands companies as a public relations showpiece (a 'Potemkin village'?). And the cleanliness and efficiency of their operations does nothing to mitigate the global warming consequences of burning buried sunshine. * Wikipedia says that bitumen is the correct name for the tar-like crude oil in these sands. It's a very complex mixture of polycyclic aromatic hydrocarbons - hydrocarbon chains that have been extensively cyclized and crosslinked into viscous tangles. What are we doing to our precious planet?? I cannot say that I totally understood the article but it sure doesn't sound safe. I'd rather see this than 400-foot wind turbines everywhere the wind blows, wrecking priceless landscapes that would never have been touched for lack of oil. As crass as it may seem, I'd rather have a relatively "compact" area wrecked for bitumen mining than wide swaths of the planet covered with industrial towers. Better solar than wind, with some nuclear thrown in when safe. The concept of "green" should include total visual impact on the land, not just the CO2 factor.